From the noble Nordic country of Denmark, here is once again the skilled musician Mr. Torben Enevoldsen (Guitars/Bass & Keyboards) a reputed Axeman famous for being the mastermind behind numerous projects and famed for being chosen to be the alter ego substitute for iconic & legendary Hank Shermann or Mattias “IA” Eklundh (ART METAL/ex-FROZEN EYES/FREAK KITCHEN), in the rank of the gloriously reformed FATE. And he’s also author of some underground but interesting instrumental albums but mainly known for some highlights releases with ACACIA AVENUE & FATAL FORCE; Torben and his renewed bunch of talented fellows are back with a perceptible newer edge :“Wall Of Silence” picks up mostly where 2010 ‘s “Sacrifice” has ended, reinforced and power by a fresh temper with maybe a more straightforward focus, or perhaps it could be rated as a Modern Metal approach ! But the nice thing is obviously that their specific signature sound is pretty much intact and instantly recognisable notably because of this particular fat and fluid guitar-tone that Mister Enevoldsen is the proud owner! The entire production concept is handeled by himself, this is also a real asset for the whole recording as the dynamics and the variations are set in a mandatory method based upon years of experienced in Melodic Metal! But the real update are mainly done by the new talented singer Nicklas Sonne (ex-DEFECTO) also frontman with the highly promising Danish band MALRUN (their yet unsung 2015 ep “Oblivion Awaits” is strongly recommended) who is performing with class some first rate vocals that are very coherent but also quite diverse in its form changing like a musical chameleon. 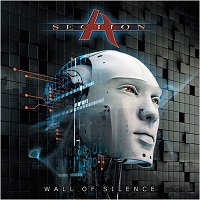 For the new album titled “Wall Of Silence” the team is completed by the ever faithful Dennis Hansen (ACACIA AVENUE & FATAL FORCE) behind the drum kit. As a die hard tradition, no new CD of SECTION A without a special guest musician, so this time Belgium citizen Julien Spreutels (ETHERNITY/EPYSODE) was invited to play some thrilling keyboard solo spots. I know my description is appetizing, indeed this is bloody exciting, the expectations are growing exponiantially but : Don’t hold your breath as “Wall Of Silence” will only be released in compact disc album and digital formats via Mausoleum Records only in late February 2016.